We Rate First 100 Days, Good Price! Very Good! Pres. Obama survived 100 days in office. I can't honestly tell you how. The recession is bad. Stocks are holding steady right now, but one big fall and there will be a run on potato sacks. Everyone is in a budget crisis, and I mean everyone. Even the potato farmers, who had to spring for burlap rather than silk sacks this year. We handed plenty of CEOs blank checks with bailouts. Needless to say, they took a lot of money for themselves. Many of these CEOs returned their bonuses when Pres. Obama checked the receipts. The rest of the executives now have the honor of being the final detainees of Guantanamo Bay. On to foreign policy: the US is still in Iraq, Afghanistan is kind of a lost cause, and Pakistan is apparently being taken over by the Taliban, province by province. The third one came out of left field, I know. But thank God we still have our 2nd Amendment: once extremists get nukes, I'll have my brand-new, almost-registered 12-gauge shotgun to fend them off with. American right-wing extremists are apparently a danger now. As if I wasn't worried enough about Pakistani and other extremists. Piracy went from being a museum exhibit, to a novelty that appeared on the BBC every month or so, to a full-blown media frenzy that got Wolf Blitzer to call Anderson Cooper "matey" at least once. It was awkward for both of them. And now pigs are spreading flu, all over the world, creating a pandemic killing a few concentrated areas of people. And that's the least of our worries. (Note: Andy's working up a report on swine flu... stay tuned for that). Grade on Health Care: Crispy. So, adding those totals up, my midterm grade for President Barack Obama is a B. Above average. The president has done well in many places. He's also backtracked better than Hansel and Gretel ever could have left breadcrumbs for. And while the crises are not his own fault: how could things possibly look up? All I can think is, at least I can still eat pork, properly cooked. Hope Everyone Enjoyed Shakespeare's 445th Birthday! I was Twittering it, which was a grand time! Also, hope someone remembered to tell you "Good night, sweet prince," 'cause I sure forgot to after all the port and sack. Zounds, the day's already upon us! Talk Like Shakespeare Day it is, in Chicago! A holiday on a stage like Chicago! Beautiful, bountiful words, Mother-Bard! For you, this heaven-sprung day is made! Be mindful! Talk Like Shakespeare Day, it is; not Talk Like Dickens Day, as is sometimes bloody easy to fall to, it is. But Where Did They Find a Guy to Take the Role? Just saying, I feel better about posting this after I found out the producers had girls' names. This is to balance the ticket my earlier post. In the midst of tax protests, Pres. Obama has named another "czar," this one for the border. Yes, they are still using the term, "czar." Look, I want to help, really, but I can't if you can't even help yourselves, Left Wingers. It's an insult. Our forefathers fought long and hard to not have people make a mockery of them and to keep tea out of this country. I'll be damned if we ruin our great coffee republic with morning cups of earl grey. Why do you think tea was dumped in the first place? As for the actual meaning of the tea parties, I don't really care. I just like the pictures of right wingers in drag! I'm told the picture linked above is not drag, but is in fact colonial garb. So, find more colonial sassiness at the Tribune here! 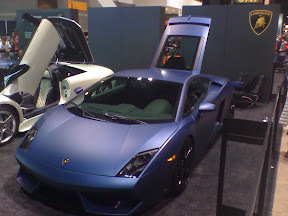 Everyone likes to know where their money goes when they give it to charity, so I decided to find out at the Chicago Auto Show back in February. 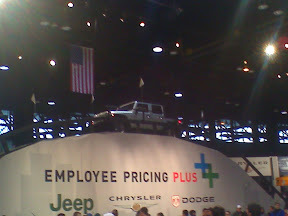 The auto show is GIGANTIC every year. I've had uncles tell me they got lost in there, with little to eat but their own shoes and Connie's Pizza. But you'd expect it this year to be more subdued. After all, the car companies are hurting. They can't afford a spectacle. They, in fact, still need our help, and are probably shaving a bit off the top of the ticket prices to fund their legal teams for faulty, explosive hydrogen cells. The Big Three came out in force. The Big Numbers One through Three showed up, as did a lot of Japanese, Germans, and KIAns. Everyone and everything was there. All that's left she needs is a paint job. 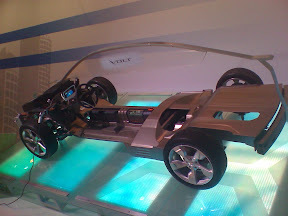 With this, Chevy had a powerful case at this auto show that they were changing and fixing their internal problems. 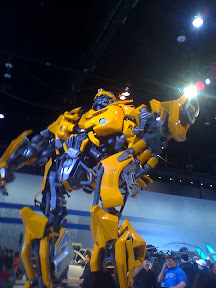 Transformers also made an appearance for Chevy, convincing me of this point. Aside from military uses like that, when your tax dollars are at work, you want to know they are being used to make your life easier. (After all that math and imaginary numbers, what else?) The best part is, government loves to make things idiot-proof (as much for themselves as anyone). This year, they've outdone themselves with a new mandate, as there's no more throwing away the instruction manuals: they're printed right on the paint job! 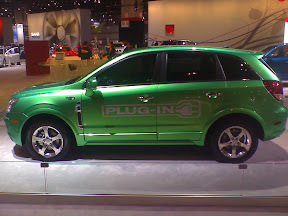 This plug-in car plugs in... I think right here. Lambourgine made an appeasement of an appearance in the middle of the floor. This company is beginning to truly show the world what can be done to fix the energy crisis and reduce our dependence on foreign oil. They've harnessed the abundant natural drool of men wandering by. Don't lie that you didn't short your keyboard. Hummer even managed to show its overcompensation of a grill, even in the face of environmentalist hatred. They even showed up with a lovely obstacle course. But the outraged people crowd, picketing Hummer's polluting policies, stopped anyone from getting in line for the obstacle course. I ended my inspection the classic way: staring at greaser-mobiles and plucky Model-Ts. 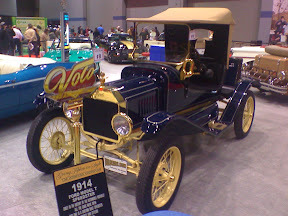 By the way, back in MY day, cars didn't need bailouts--though they often needed a push. You mean, the Easter bunny stopped by already? But... I wasn't even ready with my camera! I mean, I need evidence... license plate number, registration, something! Are you paying attention to this AP versus Google situation? You know, the one where Google users find AP wire stories all over their searches that are relevant and AP gets nothing but their names in all the papers? And where websites shouldn't embed AP audio or video made available to the public? And where websites shouldn't be quoting AP-written headlines to link to AP stories? I mean, if you don't stop it now, AP, next thing you know someone'll be torrenting all your copy. Now, I've secretly promised myself that I won't weigh in for Google or AP or whoever else is launching themselves into the battle of the monolithic nerd agencies. I will just give you what I'm best at: irony. Then some more irony. And then I'll search for more irony. Chicago Collectively Said, "He Wasn't Already?" But, most importantly, Mike, this means no more comebacks, no? From the Tribune: "I don't like being up here for the Hall of Fame because at that time your basketball career is completely over," Jordan said. "I was hoping this day would be 20 more years, or actually go in when I'm dead and gone." And even then, there's reanimation for the kind of money Mike has. My friend Ken--a basketball fan, a Cubs fan, and someone who I refuse to believe is spanking me in the NCAA brackets, even when my Final Four were half-out in the first round (thank God for Arizona!) --asked me and Andy what we were going to watch tonight: the Cubs opening day game in Houston or the Michigan State-North Carolina NCAA Championship game. Yes, I will even drink diet coke for you, Felicia. Especially if you're the one that does Ingrid Bergman's lines--I have trouble keeping up my over-enunciated falsetto. I am appalled at my own title. For I found this today. So I ask: Lewis & Clark, serial killers or victims of a comedic hoax? Oh, and this is a shout out to these guys, who followed me on Twitter. Remember: Twitter: everyone's using it now, so why shouldn't you follow me? This thing really exploded, didn't it? Labels: Comedy, Critters, History, Is/Are the Media? There are no April Fools' Jokes here. Or here. Or here. Just kidding! Of course there's an April Fools' Joke here! I mean, OF COURSE the US is lifting the ban on Americans traveling to Cuba! Why wouldn't that be true? And it's not like we're gonna sabotage and infiltrate anything while we're there in our floral prints and khaki cargoes. That would be silly! Though silliness abound: it is April 1st! Happy April Fools' Day!